In a major move, QVM have announced a partnership with Air Canada to install Melbourne's first outdoor summer ice rink under the sheds at the top of C Shed on Peel St.
"The rink will host hourly skating sessions, with all the kit available to hire, from skates and helmets to knee pads. What's more, the fun continues off the ice, with a plethora of tasty rink-side offerings. Think fairy floss, buttery popcorn, maple syrup ice cream from Market stalwart Geloso Gelateria, and of course, plenty of poutine — Canada's famed dish of French fries, cheese curds and gravy. 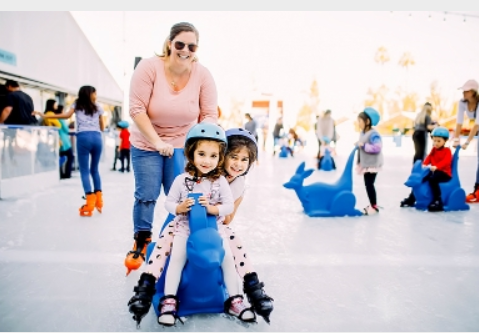 The Air Canada Ice Rink will open market days (Tuesdays and Thursdays through Sundays), as well as Wednesday nights to coincide with the Summer Night Market season." This promotion will operate from 1/12/2018 to 24/12/2018 and looks like a fun family attraction for our market.